January 8th started out crisp and partly cloudy. Temp’s hovered around freezing as I drove to Montgomery County and delivered more copies of the Uwharrie Lakes Region Trail Guide to Melinda at the Eldorado Outpost. My next goal was to explore the Town of Troy Nature Trail. I had seen the sign for this trail on NC 24-27, just east of Troy, but couldn’t find much information about it. One of my roles as a guidebook author is to remedy situations like that! So with topo map, GPS, and notepad in hand, I set out for a day of hiking adventure. I started at the small gravel parking area on Glen Road, not far from it’s intersection with NC 24-27. There is room for maybe half a dozen vehicles in this lot. The trail is marked with an eclectic application of orange paint blazes. The Town has erected nice wooden direction signs at all of the trail intersections. The Town has also added an interesting assortment of footbridges, stairs, hand rails, and hand lines to help hikers deal with some of the spots where footing is less secure. There hasn’t been a lot of work done on the trail tread itself, but the route follows old roadbeds and flat riparian terrain for much of it’s length, so the tread is quite manageable as is. Overall, I’d rate the difficulty level of this trail slightly above Moderate towards the Difficult side. I certainly enjoyed my hike on it! From the 24-27 parking area, the route heads east and drops down towards the confluence where Denson’s Creek joins the Little River. A side trail splits off near the bottom and will take you along the Little River and under the NC 24-27 bridge. The main trail follows Denson’s Creek upstream for just under half a mile before turning right on a gravel road and crossing a low-water bridge to the east bank. The trail stays on the east side of the creek from there on. If you turn left at the gravel road, you’ll soon find a trail crossing for the USFS’s Denson’s Creek Trail loop. 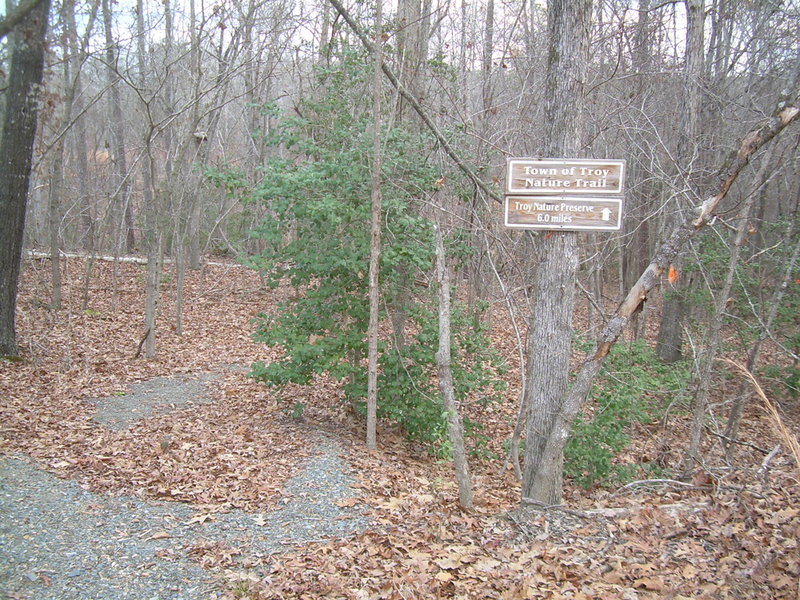 This easy connection between the two trails is not indicated on the trail signs. The Nature Trail never gets far from Denson’s Creek, although there are a few rocky bluffs that the trail climbs up onto before dropping back to the floodplain. I enjoyed a few longer-range views up the creek valley a few times, but I’m not sure that would be true after leaf-out in the spring. Just over a mile and half up the creek, I passed what appears to be the dismantled supports for a cable span foot bridge across Denson’s Creek. It wasn’t very old, so I’m guessing it might have been damaged in a flood? The creek is substantially wide at this point, perhaps 50 feet across and a few feet deep. The banks are about 6-7 feet high, so it looks like a good place for a span bridge. I learned later that the trail at the other end of this missing bridge ties into the USFS’s Denson’s Creek Trail. Not far past the missing bridge location, you will be able to see the Town’s wastewater treatment facility on the west side of the creek. Another mile farther and the trail passes under a railroad bridge. The next major landmark is where the trail crosses Okeewemee Road. There is a wide pull-off at this road crossing, where you could probably park 2-3 cars. 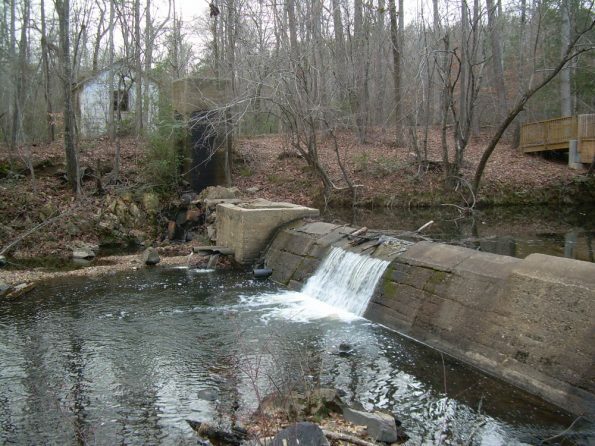 Within sight of the road is a old concrete dam across Denson’s Creek. There is a nice footbridge across the creek just above the dam, and an old pumphouse. I suspect this might have been the Town’s water supply impoundment at one time, but has since been replaced with a newer, larger impoundment upstream. Another half mile up the creek is a much larger dam. 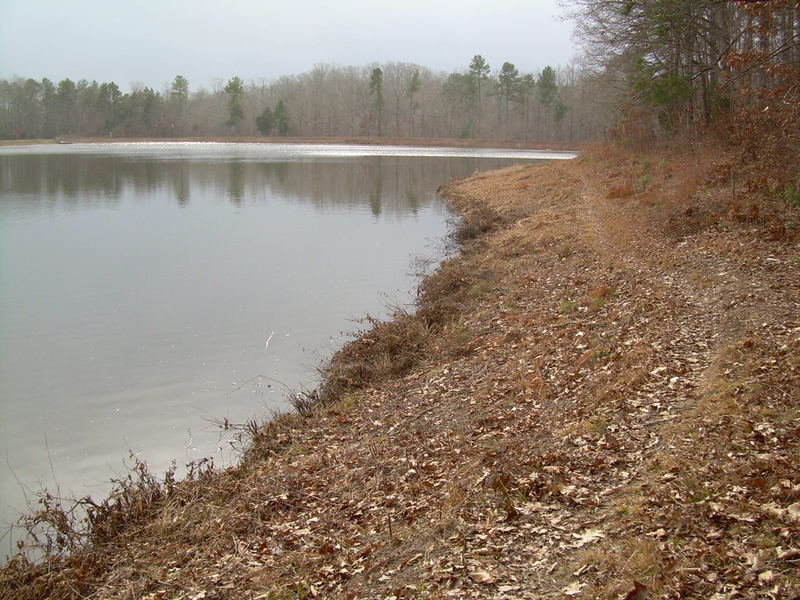 The trail turns from the creek at this point and climbs a short distance to the edge of a 30+- acre lake. 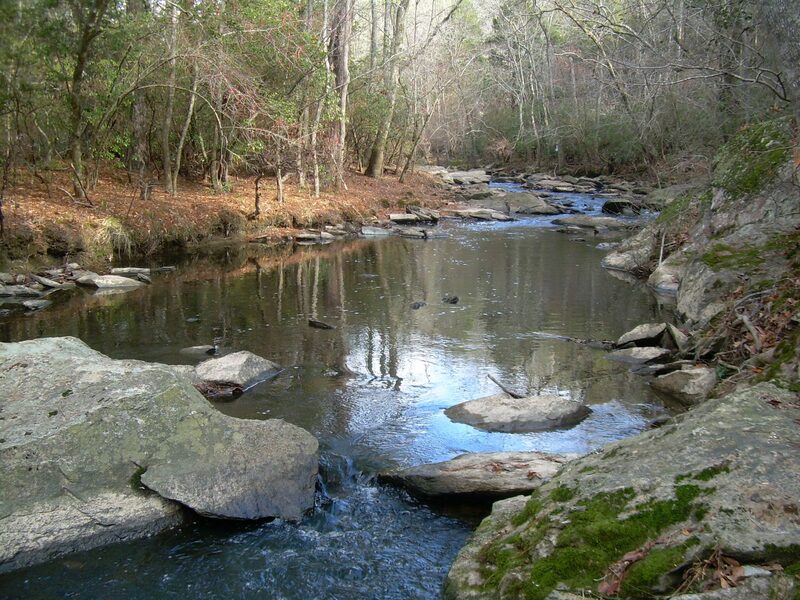 This is the current water source for the Town and is the key feature in the Roy J. Maness Nature Preserve. The Preserve was dedicated in 2000. There is a loop trail running around this lake, as well as a large paved parking lot and a couple of campsites. I need to research more of the details on this park’s hours, camping rules, etc. When I hiked through, the place was deserted and there was a cold wind blasting tiny snowballs across the lake. One particularly strong gust took my hat for a flight and gave me a tour of the lower side of the dam embankment. On the far side of the lake, I sat on one of the benches and ate my lunch in the sunshine, with snow falling steadily all around. That was quite an unusual experience! From the Nature Preserve, I retraced my steps to the railroad bridge, found a place to rock hop across the creek and stay dry, and followed the tracks over to Glen Road. My initial intention was to walk the road back to the truck to save some miles and time. But the lure of more trail adventure got me and I jumped onto the USFS’s Denson’s Creek Trail where it crossed the road and hiked around that trail loop. There are connections off of the trail that lead you to the USFS Ranger Station, and to the USFS Fitness Trail, so you can add more miles to a trip here if you want to. I finally made it back to the truck around 2pm. I had started at 10am, so I was out for 4 hours. Without the side trip on the Denson’s Creek Trail, I should have been able to easily hike up to the Nature Preserve and back in 3.5 hours. Look for the Town of Troy Nature Trail and the Roy J. Maness Nature Preserve Trail to be detailed in the next edition of the Uwharrie Lakes Region Trail Guide. See more pictures from this hike here.